Of all the things I think you should invest in once moving into a new apartment it is a bed and a couch. Dining tables come by the dozens on Craigslist and in your local vintage stores. Good ones. Useful ones. Need a lamp? You’ll find that too. Need a bunk bed? Try and make one! (A story for another time) But beds that feel good are trial and error, and of great importance. When we finally got ours, we were a week shy from moving into our new apartment. The apartment was disorderly, we were all a bit flustered, tired, and admittedly, frustrated. But we knew we had a bed. 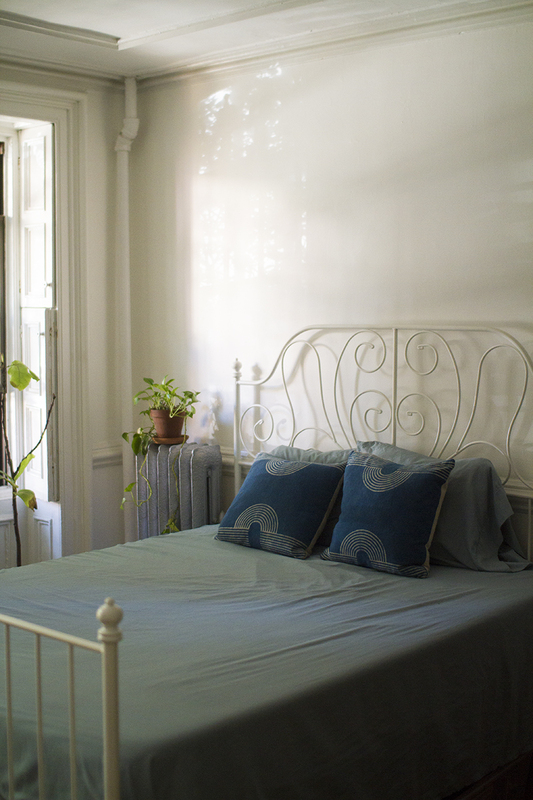 A queen size mattress in a box from Tuft & Needle that would arrive on our stoop any day. We knew that as long as their was a bed on the floor and food in the fridge and the light coming through the windows, everything else would come together as fast as it could. We slept together in that bed that first night– all four of us. River’s feet to Peter’s face. Oaks lips tucked under my chest. – Don’t be afraid to upsize. Now that we have had this queen bed, I can’t believe we lived with a full-size bed for so many years. Where did our feet go? How was it even comfortable? . – Trust the brand. I was a little skeptical if the bed would be comfortable and as easy as Tuft & Needle claimed, but after scrolling obsessively on their instagram page, I was convinced! When it comes to brands, find one that has good reviews from everyday people as well; not just bloggers. – Purchase a complimenting frame. So many of you have inquired about our bed frame after I have posted images of it on instagram. The frame is from Ikea! I spent days looking for a vintage one at a few online re-sale shops, but after a while, we decided to go for a mock frame and it looks beautiful. – Invest in good sheets. After some back and forth, Peter and I agreed, I don’t really like quilts on the bed. It is weird pet-peeve of mine. I’ve gone back and forth, but I’d much rather leave sheets on the bed and have our quilt or blanket folded in a basket under the bed. In the winter, I will pull out our dutch quilt his mother gifted us and fold it tightly on the end. – Don’t be afraid to make the bed the center of the apartment. We have a living room, but as it turns out, we rather congregate in our bedroom. It has been this space where guests sit and chat and we listen to music from the computer and laugh with wine glasses in our hands. It is also the place where we play hide and seek in the early evenings; the kids burrow under the bed and in-between the sheets.